In 1916 a lexicon entitled The Australian Comic Dictionary of Words and Phrases was published in Melbourne by E.W. Cole. The author was one ‘Turner O. Lingo’, a nom de plume for writer Mary Eliza Fullerton. The volume runs to 64 pages and includes over 600 entries with their definitions arranged (roughly) alphabetically from Z to A to reflect the ‘Antipodean’ nature of the work. This dictionary is a milestone in lexicography: it is the first Australian dictionary written by a woman, and the first comic dictionary of Australianisms. 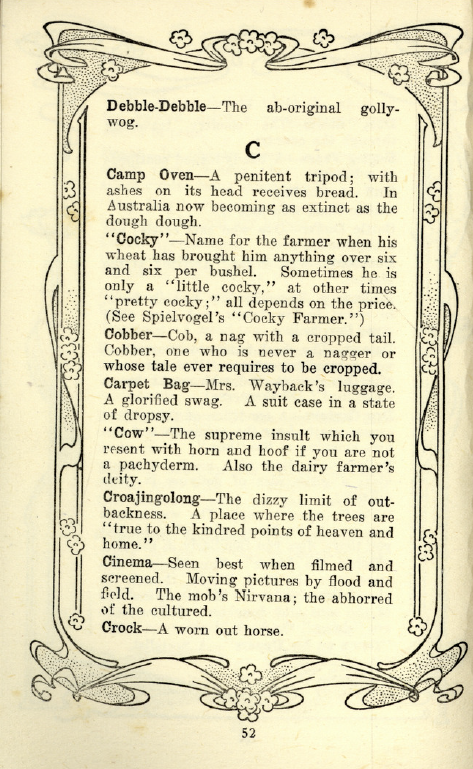 A comic dictionary uses the format of a standard dictionary for humorous purposes. As Julie Coleman points out in A History of Cant and Slang Dictionaries ‘[a]lthough sharing the iconoclastic stance of some slang glossaries and commonly catalogued as such, comic dictionaries tend to concentrate on non-standard definitions for standard English terms’. (Volume 3, 2009). There are a number of early precedents for the comic dictionary, including some humorous definitions in Samuel Johnson’s otherwise serious tome, A Dictionary of the English Language (1755). His definition of oats is well-known: ‘a grain which in England is generally given to horses, but in Scotland supports the people’. 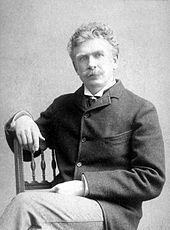 Perhaps the best-known comic dictionary is Ambrose Bierce’s The Devil’s Dictionary, which was published in full in 1911. 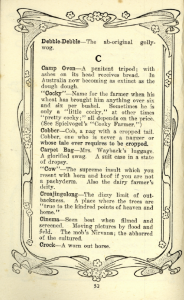 Material for this dictionary had already been published in various forms, including US newspapers, from the 1870s. The definitions for lawyer (‘one skilled in circumvention of the law’) and conservative (‘a statesman who is enamoured of existing evils, as distinguished from the Liberal, who wishes to replace them with others’) provide good examples of the satirical nature of this dictionary. 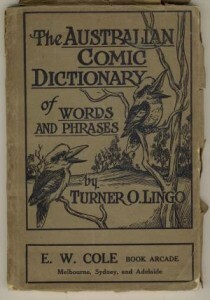 The Australian Comic Dictionary follows the same format as The Devil’s Dictionary but, rather than providing definitions for standard English terms, many of the headwords are derived from Australian English. As stated in the introduction: ‘The endeavour has been to make this dictionary especially Australian in character.’ Following are several examples of entries that appear in the dictionary. Billy Tea, a milkless beverage flavoured with Eucalyptus and ants; takes some ability to make and some agility to drink. Cup Race, the Australian Race witnessed by the Australi­an race. Drover’s Wife, a bush Joan of Arc without a pedestal. Governor-General’s Speech, nothing, drest in flourishes. ‘It Isn’t Cricket’, what you have to keep telling your old lady relative when you take her to a football match. Kerosene Tin, the bush conjuror’s ‘property’ which he transforms into four hundred and six different articles for domestic use. Nulla Nulla, nothing at all; a phantom waddy. Ropable, what the man is when the animal isn’t. Tinned Dog, bushman’s pate de fois gras. Wallaby (on the), refers to the custom that prevails in Australia of travelling on a wallaby; a favourite pastime with persons who cannot afford a horse. Yarra Banker, usually a man who stands on a soap box telling the great unwashed how ‘dirty’ the rich man is. * For more detail about Mary Eliza Fullerton you can read her entry in the Australian Dictionary of Biography, and her profile on the AustLit website. This entry was posted in ANDC, dictionaries, women, writers and tagged billy tea, comic dictionary, cup race, drover's wife, Governor General, it isn't cricket, kerosene tin, Mary Eliza Fullerton, nulla nulla, on the wallaby, ropable, shickered, tinned dog, Turner O. Lingo, Yarra banker by Mark Gwynn. Bookmark the permalink. I mention this dictionary in my biography of Mary Fullerton: Passionate Friends: Mary Fullerton, Mabel Singleton and Miles Franklin (London, Onlywomen Press, 2001). Based on my PhD thesis at Griffith University.